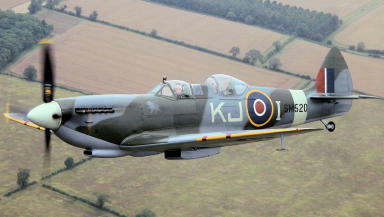 Montrose Air Station Heritage Centre unveiled its newest exhibit, a full-scale replica Spitfire. The Earl of Wessex has helped Montrose Air Station Heritage Centre celebrate its 100th anniversary. As the first military air base in the United Kingdom it helped train many of the pilots that flew in the two World Wars. Unveiling a commemorative plaque to honour those who served at the station with the Royal Flying Corps and later the Royal Air Force, Prince Edward, the Earl of Wessex who became a Great Uncle last week was on hand to perform the ceremonial duty. A flypast from old and new helped the celebrations on their way but it was the 100-year-old air station's newest exhibit that stole the show - a full-scale replica Supermarine Spitfire called Red Lichtie, bought with money raised locally and a grant from Angus Council. Former servicemen showed why the air station is such a central part of Angus' military history and said they hoped it would continue to be important for another century to come.